Indonesia’s latest major forest and peat fires left a trail of devastation in their wake. The fires, which reached a peak in March similar to that seen in the June 2013 haze crisis, produced vast amounts of choking smog. This led to the closing of hundreds of schools and several local airports, and may have caused respiratory illness in more than 50,000 people. Tragically, these fires are far from an isolated incident. Indonesia suffered two major forest and peat fire disasters in the same region during the last year. Another dry season is just two months away. Stopping the recurring fires and protecting Indonesia’s communities, businesses, and forests requires a proactive plan to prevent future fires, or at least greatly reduce their intensity. As part of our ongoing series, WRI’s researchers have used data from the new Global Forest Watch platform along with preliminary on-the-ground research to analyze Indonesia’s forest fires and haze problem. We’ve come up with three priority recommendations that could be implemented quickly to help reduce the risk of future fires. Indonesia is divided into 34 provinces, within each of which there are districts, and smaller subdistricts. By overlaying NASA fire alerts with Indonesian provincial, district and sub-district boundaries, we can see that the Province of Riau accounts for over half of all fire alerts in Indonesia (58 percent) and over four fifths (81 percent) of all fire alerts across of Sumatra over the past 12 months (See Figure 1). Digging deeper into the data, we can see that within Riau Province, just a small number of districts have suffered the brunt of the fires. Four districts within Riau Province—Bengkalis, Rokan Hilir, Pelalawan and Siak—were the location of 52 percent of fire alerts across the whole of Indonesia over the past year (See Figures 2 and 3). Within these four districts, Global Forest Watch pinpoints a handful of even smaller sub-districts as the locations for the largest numbers of fire alerts, with Bukit Batu, Tanah Putih, Kandis, and Medang Kampai topping the list. This is an important finding, because it suggests that if Indonesian officials focused fire prevention efforts and resources—as well as investigation and enforcement—in a small number of Riau subdistricts, they could greatly reduce overall fire and haze risk. Global Forest Watch analysis shows that 75 percent of the fire alerts in Sumatra overlap with peat, a type of soil made of partly decomposed organic material (See Figures 5 and 6). Fires on peat burn longer and produce more smoke than other fires, and played a major role in the damaging smog and haze over the past year. Peat fires are also much harder to put out and release far greater amounts of greenhouse gases into the atmosphere than fires in non-peat areas, and they produce smoke that is associated with an increased risk of respiratory illness and heart attacks. Therefore, Indonesian authorities and others, including national and local governments, law enforcement officials, businesses, and communities, should prioritize prevention of peat fires, with special effort focused in the sub-districts and districts of Riau noted above (See Figures 3 and 4, above). 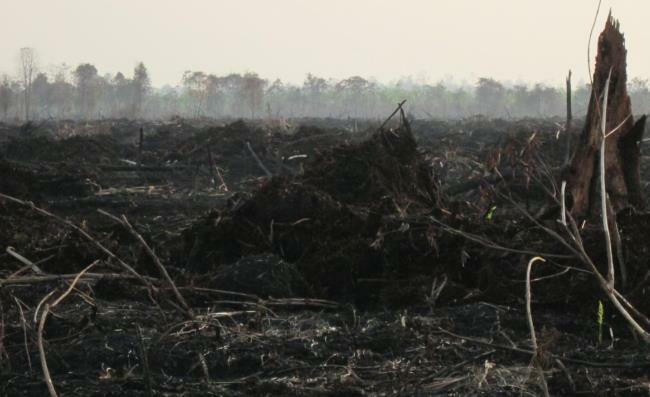 Many fires are associated with the development of large palm oil, timber, and logging companies. This is consistent with WRI’s earlier findings that half of all fire alerts are located in large concessions where these commodities are developed. However, fires are started by many stakeholders for many different reasons. For example, some small farmers are using burning as a low-cost way to clear land for farming. These fires easily burn out of control, spreading across community and concession areas, and even destroying established croplands. Some burning may be a result of conflict between large pulpwood and oil palm companies and small farmers. Local communities and large-scale agriculture in Indonesia share complex relationships, often fraught with conflict, as demonstrated during a recent clash at PT Asiatic Persada in Sumatra that killed one community member. Fire may be used by some communities to claim conflicted land or wreak revenge on companies. Small and medium-sized companies may also be using fire illegally to quickly clear land. This is consistent with earlier findings from the World Agroforestry Center, which identified “local, mid-level entrepreneurs” as responsible for much of the burning. Fires burned hundreds of hectares of land managed by PT. Surya Dumai Agrindo, a supplier for RSPO member First Resources. Near Dompas Village, Riau Province. Photo by Julius Lawalata, March 2014. Wilmar employees and the Indonesian Army patrol for fires with a truck full of water. Near Selinsing Village, Riau Province. Photo by Julius Lawalata, March 2014. 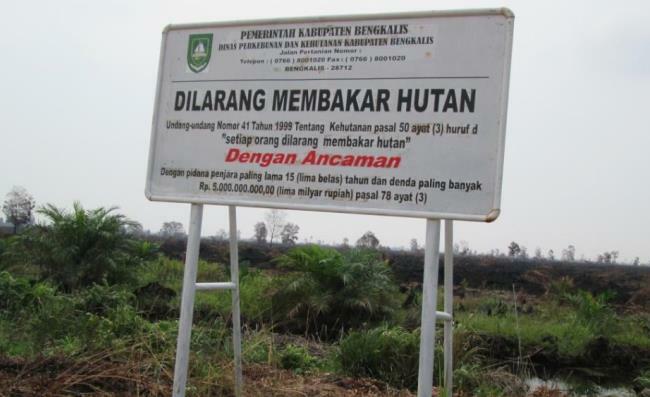 A sign stating “Forest fires are prohibited” stands in front of hundreds of hectares of burned land near Selinsing Village, Riau Province. Photo by Julius Lawalata, March 2014. Indonesia’s government, together with its partners such as leading NGOs and international development agencies, can use this information to focus their efforts in Riau. Major companies such as APRIL and Sinar Mas, which have major plantation development operations across Riau, could also assist beyond the boundaries of their concessions with their superior capacity, monitoring systems, and equipment. Develop programs and partnerships between local governments and major companies to give small farmers low-cost access to mechanical land clearing equipment, starting in the most fire-prone parts of Riau. Target conflict areas between companies and communities to address land claims and long-standing disputes. For example, the Indonesian government’s ONEMAP initiative and associated efforts could prioritize Riau in efforts to reduce conflict and address claims. Ramp up enforcement efforts targeting companies that are illegally starting fires. Arresting small farmers will not significantly reduce the risk of future fires especially if those farmers have no alternatives for land clearing. Indonesian law enforcement should therefore prioritize investigating small, medium, and large companies and ensure that those responsible for illegal burning are held accountable, together with any government officials that have been complicit in illegality. 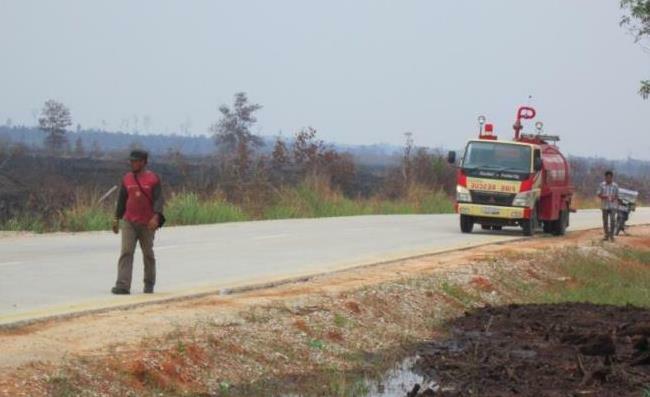 Indonesia’s Corruption Eradication Commission (KPK) and their special unit on forest crimes could perhaps focus efforts on Riau given the enormous importance of fire prevention. Each time Indonesia experiences a fires crisis, its economy and communities suffer terribly. Fighting the fires once they are ablaze is ineffective, extremely expensive, and dangerous for firefighters and surrounding communities. A comprehensive, proactive fires prevention plan, with a special emphasis on key subdistricts in Riau Province—involving government, business, and NGOs—can help ensure that Indonesia’s forests continue generating economic, social, and environmental benefits for years to come. LEARN MORE: For more WRI analysis on Indonesia's fires, check out our blog series.